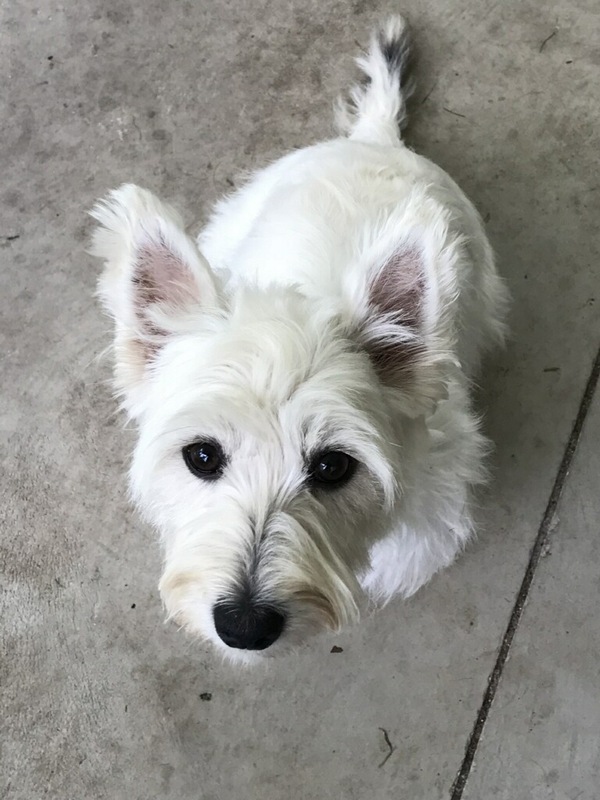 Panda is a happy Westie girl that just loves people. She is Chloe’s sister— read Chloe’s story here — but unlike Chloe, Panda has no health issues. At about two-years-old, Panda has a long life of love and joy ahead of her and will make a wonderful companion for some lucky person or family. Panda enjoys playing tug with other dogs and loves toys, especially squeaky toys. Panda’s foster mom is working on her training including walking calmly on a leash. Playing in the dirt is a favorite pastime for Panda, and she loves the foster mom’s pool. She talks for attention, but she is not a barker. Panda craves attention from her people and, when she isn’t playing, loves to snuggle on a comfortable chair or couch. Panda and Chloe spend time together, and Panda looks out for Chloe although Chloe seems to be the alpha. Panda will not be adoptable until Chloe’s surgery is over and then Aggie of Sunshine State Westie Rescue (SSWR) can determine if the two sisters are bonded or whether they can be placed separately. When Panda is ready for her forever home she will need a fenced yard, other dogs to play with, and a family or single person who is relatively active and can give Panda the play time and attention she needs. She is good with kids, but cats are a no-no. Also, she will need someone who is home must of the time as she would not do well left alone for eight or more hours. Chloe’s surgery is set for August 28. 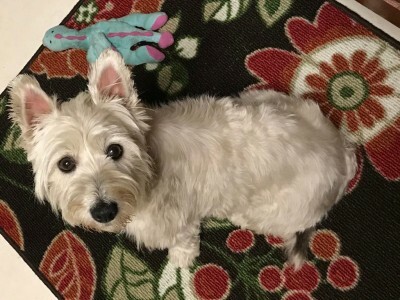 Please remember this is a very involved and expensive surgery and Sunshine Westie Rescue would appreciate donations for Chloe. Even a small amount helps. AUTHOR’S NOTE: Most of my readers know how dedicated I am to pet therapy. Panda, with her joyful personality and love of people, would make a wonderful therapy dog. There are many therapy pet organizations out there, but I belong to Love on a Leash. You can google them for more information to begin a journey on a very rewarding path. Go here to learn more about Panda and her friends at SSWR, to volunteer, or make a much needed donation for Chloe. Candy and I are very interested. We currently have Brody, a 10 yo Westie who’s third in a succession (30 years! 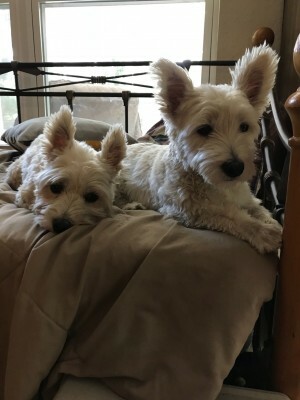 ).Love them and are talking about the next Westie—we’d love a female this time around and she could fit the bill for a very loving Westie home. Pls keep us informed— we could be the perfect match! looking for a long time for one. I am in FLORIDA and would love to give Panda a home.